Jamaica’s agriculture sector suffers from many woes, including natural disasters that caused $14.4 billion in losses between 1994 and 2010, according to Dinesh Ram, the designer of this innovative floating bamboo dome concept. An noteworthy entrant in Inhabitat‘s recent Biodesign Competition, the Hope Waters Dome is designed to combat the twin dangers of rising sea levels and food scarcity in the water locked nation, and it could be built using locally-available materials such as bamboo and plastic. The bamboo geodesic dome is designed to provide multiple functions, including growing space and meeting space. The bamboo frame would rest on a platform made with recycled plastic bottles for buoyancy, addressing Jamaica’s burgeoning problem of overstuffed landfills. The upper floors are designed to operate as an “urban agriculture learning center” where food can be grown without risk of inundation from rising seas. Albeit just a concept at this point, the design recognizes that over the next few decades, we are expecting to see a one to two meter rise in sea levels. Given how much Jamaica in particular depends on its coastline for its economic well-being, now is the time to begin devising thoughtful solutions to build the country’s resilience. The Hope Waters Dome project is designed to build resilience in Jamaica, a water-locked nation with major food security issues. Jamaica's agriculture sector suffers from many woes, including natural disasters that caused $14.4 billion in losses between 1994 and 2010, according to Dinesh Ram, the designer of this innovative floating bamboo dome concept. An noteworthy entrant in Inhabitat's recent Biodesign Competition, the Hope Waters Dome is designed to combat the twin dangers of rising sea levels and food scarcity in the water locked nation, and it could be built using locally-available materials such as bamboo and plastic. The bamboo frame rests on a platform of recycled plastic material. 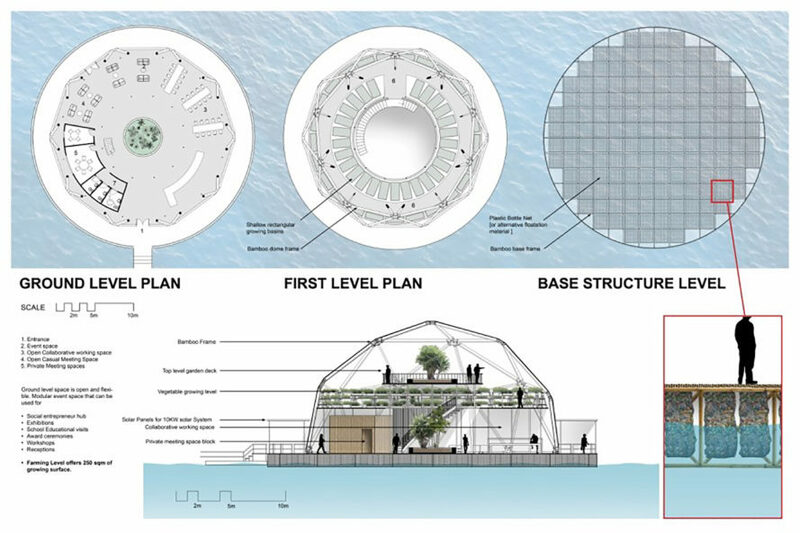 The dome would provide 250 square meters of growing space that is safe from rising seas. 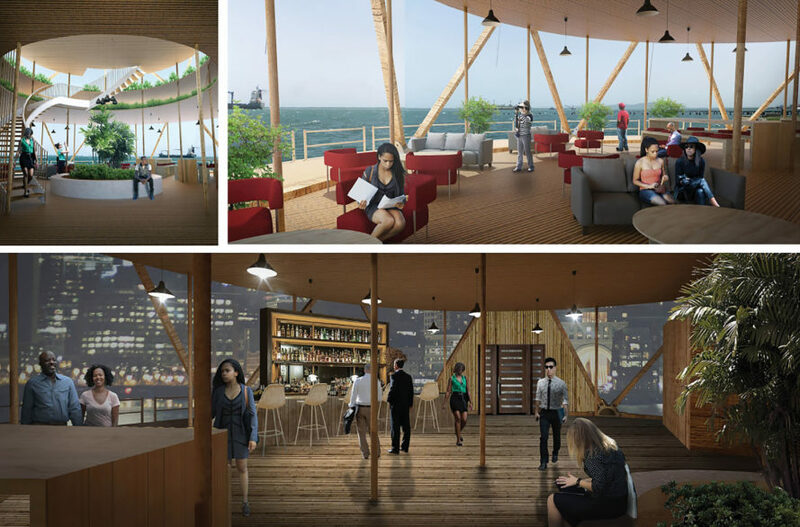 The floating dome would also act as a modular meeting space.